To be read in conjunction with Douglas Theobald's 29+ Evidences for Macroevolution FAQ. Whether or not the idea of macroevolution can be falsified, and whether specific accounts of macroevolution can be falsified. A later version will add a section on how creationists "move the goalposts" when confronted with undeniable evidence of macroevolution, but for now see the sister FAQ of Douglas Theobald. The reader is invited to skip the section on reduction. This is a largely philosophical discussion included because it is a debate within the scientific community. It has no impact on the fact of above-species evolution (that is, on speciation, common descent, and pattern in the phylogenetic record). But it is often the subject of heated debates in forums discussing evolution in the context of creationism. Words are not the master of science; science is, or should be, the master of its words. But we can inquire how scientists use their words, and whether they use them consistently. And having done that, we can inquire whether others who are not scientists read too much into them, or use them in a totally different way. Is macroevolution reducible to microevolution? Creationists often assert that "macroevolution" is not proven, even if "microevolution" is, and by this they seem to mean that whatever evolution is observed is microevolution, but the rest is macroevolution. In making these claims they are misusing authentic scientific terms; that is, they have a non-standard definition, which they use to make science appear to be saying something other than it is. Evolution proponents often say that creationists invented the terms. This is false. Both macroevolution and microevolution are legitimate scientific terms, which have a history of changing meanings that, in any case, fail to underpin creationism. In science, macro at the beginning of a word just means "big", and micro at the beginning of a word just means "small" (both from the Greek words). For example, "macrofauna" means big animals, observable by the naked eye, while "microfauna" means small animals, which may be observable or may not without a microscope. Something can be "macro" by just being bigger, or there can be a transition that makes it something quite distinct. In evolutionary biology today, macroevolution is used to refer to any evolutionary change at or above the level of species. It means at least the splitting of a species into two (speciation, or cladogenesis, from the Greek meaning "the origin of a branch", see Fig. 1) or the change of a species over time into another (anagenetic speciation, not nowadays generally accepted [note 1]). Any changes that occur at higher levels, such as the evolution of new families, phyla or genera, are also therefore macroevolution, but the term is not restricted to those higher levels. It often also means long-term trends or biases in evolution of higher taxonomic levels. d Figure 1: Anagenesis and cladogenesis. 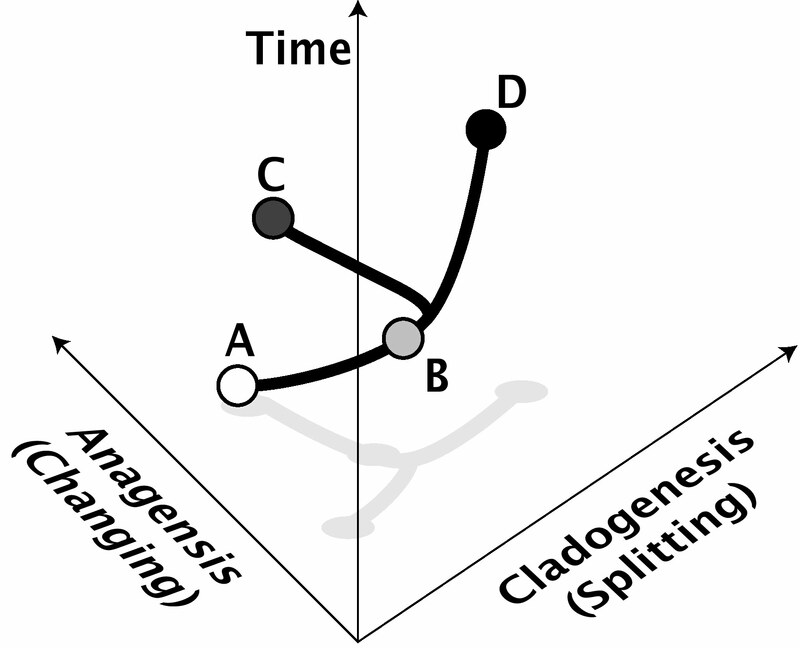 In this example, species A anagenetically changes over time to become species B, while species B cladogenetically changes over time by splitting into species C and D, neither of which are very different from B or each other. The anagenesis axis represents change of form, either genetic or phenotypic. The cladogenetic axis represents isolation of species from each other (for example, reproductive isolation). Of course, cladogenesis and anagenesis can often go hand-in-hand as well. Anagenesis is not regarded by most scientists as "real" speciation, although it is indistinguishable in the fossil record from a cladogenetic event. Another way to state the difference is that macroevolution is between-species evolution and microevolution is within-species evolution. Sometimes, macroevolution is called "supraspecific evolution" (Rensch 1959, see Hennig 1966: 223-225). There are various views of the dynamics of macroevolution. Punctuated Equilibria are patterns of change that indicate stasis, or long periods of time where species exhibit very little change. There are several hypotheses that attempt to explain stasis. The current consensus among paleontologists is that large populations are buffered against evolutionary change by natural selection or genetic drift. Evolutionary change becomes easier when populations split into smaller demes. This change can be "locked in" if the subpopulations evolve reproductive isolation and become separate species. That's why change is associated with cladogenesis. Phyletic gradualism suggests that species continue to adapt to new challenges over the course of their history (see Fig. 1). Species selection and species sorting theories think that there are macroevolutionary processes going on that make it more or less likely that certain species will exist for very long before becoming extinct, in a kind of parallel to what happens to genes in microevolution. How did the terms enter into scientific use, and what has happened to them since? The terms macroevolution and microevolution were first coined in 1927 by the Russian entomologist Iuri'i Filipchenko (or Philipchenko, depending on the transliteration), in his German-language work Variabilität und Variation , which was an early attempt to reconcile Mendelian genetics and evolution. Filipchenko was an evolutionist, but as he wrote during the period when Mendelism seemed to have made Darwinism redundant, the so-called "eclipse of Darwinism" (Bowler 1983), he was not a Darwinian, but an orthogeneticist (he believed evolution had a direction). Moreover, Russian biologists of the period had a history of rejecting Darwin's Malthusian mechanism of evolution by competition (Todes 1989). In Dobzhansky's founding work of the Modern Synthesis, Genetics and the Origin of Species , he began by saying that "we are compelled at the present level of knowledge reluctantly to put a sign of equality between the mechanisms of macro- and microevolution" (1937: 12), thereby introducing the terms into the English-speaking biological community (Alexandrov 1994). Dobzhansky had been Filipchenko's student and regarded him as his mentor. In science as in all academic disciplines, it is difficult to deny a major tenet of one's teachers due to filial loyalty, and Dobzhansky, who effectively started the modern Darwinian synthesis with this book, found it disagreeable to have to deny his teacher's views (Burian 1994). The term fell into limited disfavour when it was taken over by such writers as the geneticist Richard Goldschmidt (1940) and the paleontologist Otto Schindewolf to describe their orthogenetic theories. As a result, apart from Dobzhansky, Bernhardt Rensch and Ernst Mayr, very few neo-Darwinian writers used the term, preferring instead to talk of evolution as changes in allele frequencies without mention of the level of the changes (above species level or below). Those who did were generally working within the continental European traditions (as Dobzhansky, Mayr, Rensch, Goldschmidt, and Schindewolf are) and those who didn't were generally working within the Anglo-American tradition (such as John Maynard Smith and Richard Dawkins). Hence, use of the term "macroevolution" is sometimes wrongly used as a litmus test of whether the writer is "properly" neo-Darwinian or not (Eldredge 1995: 126-127). The term was revived by a number of mainly paleontological authors such as Steven Stanley (1979), Stephen Jay Gould and Niles Eldredge, the authors of punctuated equilibrium theory (see Eldredge 1995), who argued that something other than within-species processes are causing macroevolution, although they disavow the view that evolution is progressive. Many paleontologists have held that what happens in evolution beyond the species level is due to processes that operate beyond the level of populations – for example, the notion of species selection (the idea that species themselves get selected similarly to the way alleles get selected within populations, see Grantham 1995, Rice 1995, and Stidd and Wade 1995 for reviews and discussions). The idea that the origin of higher taxa such as genera requires something special is often based on the misunderstanding of the way in which new lineages arise. The two species that are the origin of canine and feline lineages probably differed very little from their common ancestral species and each other. But once they were taxonomically isolated from each other, they evolved more and more differences that they shared internally but that other lineages didn't. This is true of all lineages back to the first eukaryotic (nuclear) cell. Even the changes in the Cambrian explosion are of this kind, although some (e.g., Gould 1989) think that the genomes (gene structures) of these early animals were not as tightly regulated as modern animals, and therefore had more freedom to change. Ways in which the term "macroevolution" is used by scientists. Some are exact in the way they use it, while others are less exact. These usages are not all the same, and this causes some confusion. Why do scientists not agree on the meaning of their terms? Macroevolution means evolution on the grand scale, and it is mainly studied in the fossil record. It is contrasted with microevolution, the study of evolution over short time periods, such as that of a human lifetime or less. Microevolution therefore refers to changes in gene frequency within a population .... Macroevolutionary events events are much more likely to take millions of years. Macroevolution refers to things like the trends in horse evolution ... or the origin of major groups, or mass extinctions, or the Cambrian explosion .... Speciation is the traditional dividing line between micro- and macroevolution. There are many papers published that use the term in this "higher category" way; why is that? Science is not always consistent in its use of terms; this is the source of much confusion. Sometimes this is carelessness, and sometimes this is because of the way in which terms are developed over time. When biologists and paleontologists talk about macroevolution in the sense of "large-scale" evolution, they are strictly speaking meaning only a part of the phenomena the term covers, but it is the most interesting part for those specialists. That is, they are talking about the patterns of well-above-species-level evolution (Smith 1994). In order to have a pattern you have to be able to compare three or more species (Fig. 2). On its own, species A forms no patterns, and so long as the changes within it do not result in a new species, evolution is microevolutionary. If a new species B splits from A, then you have macroevolution, but no patterns. For there to be a pattern, you need to be able to say that one species is more closely related to another than a third is (in this case, that A is closer to B than it is to C). d Figure 2: If only two species or higher taxa are identified (red set) there is no pattern. 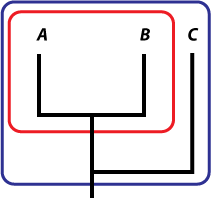 If three or more (blue set) are included, then you are able to say that one is more closely related, evolutionarily speaking, to another than the third – in this case A and B are more closely related to each other than either is to C, which split off earlier than the A/B split. The sorts of patterns that people are interested in when discussing macroevolution tend to involve very many species, either as a single large group ("higher taxon") or individually. This is why many authors use the term "macroevolution" to mean "large-scale evolution". However, just like anagenetic speciation, "large-scale" is an arbitrary and often subjective term, and the objective meaning of macroevolution is evolution at or above the level of species [note 2]. Hence, Carroll's "definition" is problematic, despite his prominence in the field, and this sort of confusion is to be avoided. A previous attempt by Simpson (1944) to introduce "megaevolution" for large-scale changes also failed to be accepted, in part because it was never entirely clear when "macro" ended and "mega" started. A more considered definition is Levinton's: "I define the process of macroevolution to be "the sum of those processes that explain the character-state transitions that diagnose evolutionary differences of major taxonomic rank" (Levinton 2001:2). Here, Levinton is trying to define macroevolution in a way that is not prejudicial to the debate he is writing about. It focuses on the characters of taxa, and is neutral about what level of taxa are involved. He denies the "species level" definition because he thinks, I believe unnecessarily, that it makes macroevolution the study of speciation. If the "pattern" analysis above is right, then macroevolution only includes the study of speciation, but it is hardly restricted to it. The scope of macroevolution rises very far above that level. It's worth observing, though, that Linnaean higher taxonomic levels are artificial, constructed for convenience by systematists. Conclusions about evolution that rely upon taxonomic levels like genera or families (e.g., Raup's and Sepkoski's work on extinction, Raup and Sepkoski 1986, Sepkoski 1987, Raup 1991) must be taken with a grain of salt, since the taxon levels are not the "same" across phylogenetically distant groups, because they are not "natural", although they may, in fact (to be shown), be good surrogates for phylogenetic diversity. Incidentally, the study of speciation has taken off significantly in recent years with some solid theoretical work that suggests many macroevolutionary effects are indeed the result of population level processes (Gavrilets 2003, 2004, Gavrilets and Gravner 1997). Using the metaphor of the adaptive landscape – the field of all possible gene recombinations for a population, each of which has a fitness value assigned to it by the environment, Gavrilets and colleagues have shown that what happens at the population level can indeed lead to divergence between them, but that most of the time populations that are maintained at a high fitness by selection can nonetheless "drift" apart at random. Hot news: philosophers of science like to argue about the reduction of one kind of science to another. Many have asked whether macroevolution reduces to microevolution. That is, whether or not larger changes in evolution are "just the sum of" small changes. We need to understand what "reduction" means in the philosophy of science before we can start accusing people of being "reductionists" or "holists". From a philosophical perspective, one might say macroevolution is just a bunch of microevolution. It's also just a bunch of chemistry. And physics. These are unhelpful answers, so we might find it worthwhile to ask how scientific domains relate to each other. Whenever a scientist or philosopher asks if two theories are reducible one to the other, there are several answers that can be given. One is if the first theory being reduced A is adequately captured by the reducing theory B. Another is that A is not entirely captured by B. A third is that A and B each have overlapping areas, and areas only they capture. This is called the problem of theory reduction. Reduction has been a philosophical problem with respect to science for about 60 years. It comes in three main varieties: methodological reduction, which is the notion that one ought to try to explain wholes in terms of the parts and their interactions; ontological reduction, which is the notion that all the units or entities of one theory are composed of units or entities of another; and metaphysical reduction, which is the claim that only one kind of thing exists (also called "monism"). Ontological reduction includes reducing all the laws and dynamic generalisations of the A theory to laws and dynamic generalisations of the B theory. In philosophy of science, the case is often put in just these terms, but increasingly philosophers are attending to the objects of scientific theories as well as the models. Consider atoms, as an example. At the time Dalton proposed atoms, he was trying to explain larger things in terms of smaller things with properties that added up to the properties of the whole. He did this because he felt it was a good rule to follow, explaining wholes in terms of parts. So he was a methodological reductionist, explaining things in terms of ontological reduction. He wasn't a metaphysical reductionist, though, if he allowed that reality comprised stuff other than atoms – such as gravity or light (or God). A parallel case is genetic reductionism, in which behaviours are "reduced" to genes – it is both methodologically and ontologically reductionist in the domain of behaviour and biology. It doesn't assert that everything in biology is genetic, though, because we know that how genes are expressed is affected by non-genetic factors, such as the availability of food during crucial phases of development. The reductive relation between microevolution and macroevolution is hotly debated. There are those who, with Dobzhansky, say that macroevolution reduces to microevolution. We can break this down to three claims: within the "universe" of biology, one might say that everything biological is best explained by microevolution (methodological), or that all entities and processes of macroevolution are microevolutionary (usually genetic – this is ontological), or that everything that happens (in biology) is genetic (metaphysical). In the metaphysical case, genes acquire an almost mystical significance, and no serious biologist makes this claim, although opponents accuse some (particularly Dawkins) of doing so. The two reductive claims we will consider now are the methodological and the ontological. The methodological claim that macroevolution (Ma) reduces to microevolution (Mi) is a claim that the optimal solution for investigating evolution is to apply modelling and testing by genetic techniques. And this has been very successful. However, it has not been an unqualified success – developmental biology is not easily reducible to genetics, nor is ecology. Cell division, specialisation and signalling explain development, and the relationship between genes and these processes is equivocal – that is, some genes play a role in many developmental processes, and many genes play a role in pretty well all processes. Moreover, there are many other things involved in development: epigenetic factors (para-genetic inheritance and environmental modulation of genetic effects), cytological inheritance (organelles, cell membranes, ribosomes and enzymes from parent cells, and parent organisms). So genes on their own are not enough to explain why evolution occurs along the pathways that it has. One reaction to methodological reductionism in biology has been to assert that genes are merely "bookkeeping" entities for evolutionary investigation (Gould 2002). The methodological reduction is not sufficient, even if genes turn out to be the only significant "players" in evolution. It is this assumption that antireductionists challenge in the ontological reductionist case. There are entities and processes, they say, that affect macroevolutionary dynamics which are not in their nature microevolutionary. What could these be? Well, a list that reductionists would accept includes climate change, geomorphological processes like mountain building, tectonic isolation and drift, vulcanism, extraterrestrial influences like bolide impacts, galactic wobble, precession of the earth's axial rotation, and possibly even local stars approaching and changing the impact on the earth of comets and other bolides in a cycle averaging around 13 million years. The point the reductionists would make, though, is that everything that these things affect is microevolutionary – only the frequencies of genes in populations, and so on. They serve as the environment in which genes change their frequency (or fail to, and the species goes extinct). What the "player" is in microevolution is the population, comprising organisms, traits and genes; in short, the gene pool. Nothing else is important. Nonreductionists will argue, however, that there are emergent processes and entities in macroevolution that cannot be captured ontologically. There are several candidates for these, each challenged by reductionists. The basis for this is a view of evolution as a series of inclusive hierarchical levels, each of which is somewhat independent of the lower levels. Mutation caused by chemical, thermal or radioactive interference. Heat shock on developing zygotes. Local adaptation to a niche. Environmental changes that cannot be adapted to for historical or developmental reasons (causing extinction). Changes that affect speciation rates and type. The frequencies of objects like species or organisms or alleles are affected by the contexts in which they occur, which are usually processes at the next level up. His notation clearly describes what may be called "Darwinian" in this respect, although one might not necessarily accept that the Macro2 level is "non-Darwinian", if by that is meant something contrary to Darwinian evolution in a broader sense. Elisabeth Vrba (Vrba 1985, Gould and Vrba 1993) proposed that species come into being and go extinct in a biased way. Generalist species (eurytopes) tend to survive longer – when one food source is unavailable, they switch to another until it comes back, thus avoiding predator-prey cycles known as Lotka-Volterra cycles (such as fox numbers dropping dramatically when rabbits are over-predated). Specialist species (stenotopes), though, are sensitive to the contingent changes forced by climate changes – even long droughts. But specialists tend to speciate more frequently, even if they go extinct more frequently, too, as they adapt to loss of degradation of their food resources. Selection is a process of differential survival correlated with ecological success, so proponents of selection of this kind consider this to be a selection process on species. Others refer to it as a species "sorting" process (see Grantham 1995 for a review) because species are not sufficiently like organisms/individuals. Gould published an extensive discussion shortly before his death (Gould 2002: 644-673). It is worth noting here that if species are selected, it is more like asexual evolution than the evolution of sexual organisms, as species rarely evolve by recombining lineages, or at least animal species don't. Plant species often do (at about 5-10% of new species), and we have insufficient evidence about other groups to generalise. Some "Non-Synthesis" or post-Synthesis evolutionists think that the processes that cause speciation are of a different kind to those that occur within species. That is, they admit that macroevolution occurs, but think that normal genetic change is restricted by such proposed mechanisms as developmental constraints. This view is originally associated with the names of Schmalhausen and Waddington, who were often characterised as being non-Darwinians by the modern synthesis theorists. However, with the recent rise of the field known as "evo-devo", or evolutionary developmental biology, many of the ideas proposed by Waddington and others have been revisited (Schlichting and Pigliucci 1998, Amundson 2005, Levinton 2001). There are several kinds of constraints upon evolution. The best known is of course selective constraints: some forms are just not viable, one way or another. But developmental constraints have been proposed to explain why, for example, in centipedes the segment number is always an odd number (Arthur 2003). In these cases, the constraint is the nature of the developmental system itself. Others (Schlichting and Pigliucci 1998) consider this as much a case of selection as anything else; the developmental system – indeed, the ability to evolve – is subjected to selection as well. Historical constraints form a kind of "you can't get there from here" class. Once something has evolved, any state that requires reversing the evolution of that trait to get somewhere else is vanishingly unlikely. So the dynamics of the evolution of that trait are constrained by what has evolved already. The notion of a bauplan – a German word meaning "blueprint" or "builder's plan" – has been applied to evolution most notably by Gould and Lewontin (1979). Bauplans (the word takes the English plural in this context) are the body plans of phyla, the second highest Linnaean taxonomic level. Since Georges Cuvier named them in the early 19th century, phyla (singular phylum) have been seen as distinct and natural groupings within animals (arguably not in plants, where the level is Division). Bauplans have been tied into the notion of a developmental and a historical constraint. There have been criticisms of the notion of a bauplan as being mystical in its causal power. Others see it as something that cannot be easily modified by the processes of within-species (Mi) evolution. One of the claims made by nonreductionists is that evolution occurs on emergent properties. An emergent property is one in which the property of a higher level system or object cannot be reduced to the properties of its constituent elements, but instead it "emerges" from the interactions between them (O'Connor and Wong 2002, Mandik 2004). Emergent properties were first proposed by, coincidentally, a friend of Darwin's, G. H. Lewes, in the field of psychology, but the idea goes back to J. S. Mill in 1843. It is often sloganized as "the whole is more than the sum of its parts". Emergence was made an issue when applied, ironically enough, to evolution in the 1920s by Jan Smuts and C. D. Broad. In evolution, a species is considered by some nonreductionists as being a system that has properties above the level of the individual, the kin, or the deme (breeding population), based somewhat on Mayr's definition of a species as being a protected breeding gene-pool ( Mayr 1996). This has been challenged on various grounds, not least being that usually species appear to have no systematic interactions between all its parts, and that the appropriate level is the population. Ma is therefore the result of the union, in some way, of E, O and I. This can be massively complex and give rise to "sudden" changes [note 3], or hold the evolutionary process in a state of stasis for long periods. Whether or not one wants to call this "repeated rounds of microevolution" or not (Erwin 2000) is open to debate. And even if it is, we still need to know the models for how they relate, and what Mi covers. The alternative, nonreductionism, posits that there are properties and processes going on that cannot be reduced to E, O, and Ialone. There are some other things happening, call them M, that need to be added into the mix. The arguments in biology are therefore concerned with what the set of Ms might be, and how they operate. It is a common claim of antievolutionists that there is a limit to the amount of change that can be made. Creationists like Gish (1979) claim that there is some limitation within "basic kinds", without being able to express exactly what basic kinds might be, or why change is restricted within them. Others such as Johnson (1991:18) claim that the limit lies in the availability of genetic variety, and that when that limit is reached change ceases, and although he does accept that "Darwinists" have "some points to make", he is hardly fair when he says that variation "might conceivably be renewed by mutation, but whether (and how often) this happens is not known" (p19). Of course it is known. We have had experimental evidence of rates of mutations since the 1910s, and modern research both mathematically and empirically confirms that rates of mutation occur at around 0.1-1.5 per zygote, which is to say every embryo has between 1/10th and 1.5 mutations on average, depending on species (Crow 1997). The average mutation rate – that is the average rate of persisting mutations in a population – is 2.2 x 10-9 (Kumar and Subramanian 2002). Further, genes do not have evolutionary histories that match exactly the history of the species in which they exist; a field known as coalescence genetics covers the ability of novel genes to persist across speciation events, so that the variability is "available" when it is selectively advantageous (Hey and Wakeley 1997). Note that this is not to say that variation is maintained in order to be available. It's just that it is available when selective pressures change some of the time. Creationists often say that species cannot be evolved from each other because chromosome numbers are different. Humans, for example, have 46 chromosomes, while chimpanzees have 48. But the human chromosome 2 is the result of what is called a Robertsonian fusion – the ancestral ape chromosomes 2p and 2q appear to have fused at their ends (telomeres) to form the human chromosome 2 (Williams, not dated), and other species that have large chromosomal differences can still interbreed (Nevo et al. 1994). DNA aligns according to local sequence rather than large-scale chromosome structure, and this is why inversions and translocation in parts of the sequence still allow interbreeding. There appears to be no single amount of genetic variation common between closely related species that prevents interbreeding. In some, only a few are sufficient. In others, much variation, such as the large chromosomal difference in Nevo's mole rats, fails to prevent interbreeding. Introgression, or the leakage of genes across species boundaries, has been observed in lizards, plants, birds, and fish. In summary, there is no barrier to species forming. This may not be enough to show that large-scale macroevolution occurs, though, according to writers like Johnson and Hitching (1982), but the logic here implies some causal force actively preventing change, rather than a problem with change occurring. For if there is enough change to form new species, and each species is slightly different from its ancestor, then simple addition shows that many speciation events can cause large-scale evolution over enough time. A journey of a thousand miles begins with a single step. Conversely, many single steps can traverse long distances. There is no evidence of any kind of barriers to large-scale change (Brauer and Brumbaugh 2001), although creationists are free to offer some. Is macroevolution a testable hypothesis? Can it be falsified? Antievolutionists try to make out that macroevolution is a tautology, the way they claim that natural selection is a tautology. The implication is that macroevolution cannot be tested and shown to be wrong, and therefore it is not science. To clarify this, consider what it is that scientists test when they test a hypothesis. Let's suppose that we are testing the idea that global warming is caused by a rise in CO2 in the atmosphere. There are two parts to this – one claim is that CO­2 causes the retention of solar and other heat, and the second is that this has happened in the past and is actually happening now. If you show that in a particular case global warming didn't happen (say, in the period of the last interglacial), you haven't thereby shown that CO2 doesn't cause global warming, nor that it isn't doing so now. All you have tested is a particular case. We can test a particular claim of macroevolution. We can test, for example, if weasels are more closely related to red pandas than bears are (Flynn and Nedbal 1998, Flynn et al. 2000). This is a test of a particular evolutionary tree or scenario. It tests a historical reconstruction. If shown, on the basis of the evidence and the best data, to be wrong, then that history has indeed been falsified. But can we test the idea of common descent? It is not possible to show that something never occurred, but it is very easy to show that where it ought to occur, it either has or it hasn't. Science will not retain a bad idea when it is shown repeatedly not to explain what we have a right to expect it to explain (this is one reason why creationism was dropped from science back in the 1850s). If macroevolution persistently were shown to run counter to the data, then science would drop it and look for another solution. Moreover, science has to an extent falsified the initial conception of macroevolution. The original idea was that evolution formed only tree-like patterns – species split like branches. A growing consensus has argued that both hybridisation (species recombining) and lateral genetic transfer (genes crossing the taxonomic boundaries individually or as part of symbiotic organisms that are taken into the "host" taxon's cellular machinery) are more common than we had previously thought. 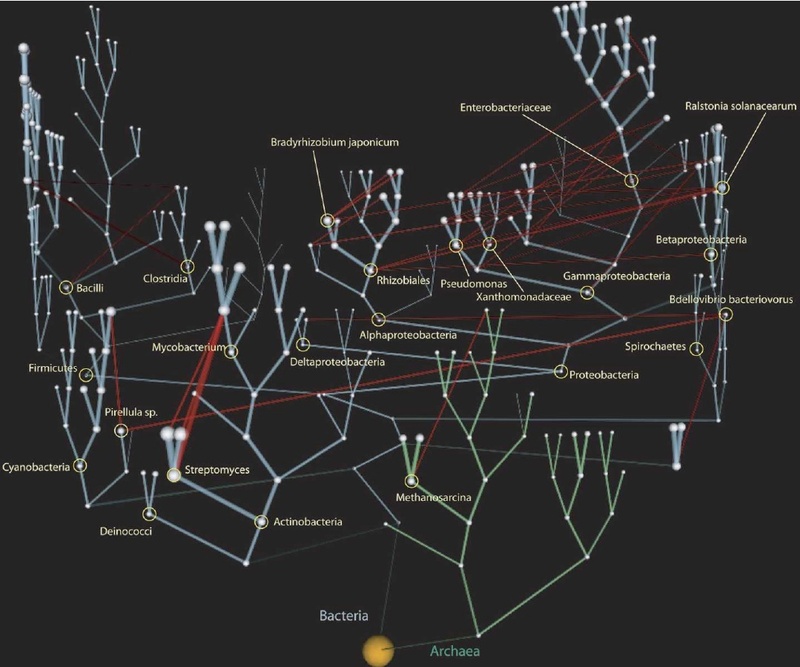 Macroevolution of species is still regarded as the most common way that the diversity of life has developed, but the "tree" now has "vines" that hang across the branches of single celled organisms (Fig. 4). So the Common Descent Hypothesisas we might call the general idea, or the notion of Descent with modification as Darwin called it in his correspondence, is tested every time a particular hypothesis is tested. When there are problems in enough phylogenies, then Common Descent may be rejected. So far, though, it is a very good first approximation, and the fact that revisions can be and have been made show that it is neither dogma, nor insulated from data. Is Microevolution distinct from Macroevolution and vice versa? We concluded that this depends very much on what is meant by "distinct" and so forth. All phenomena of microevolution – evolution below the species level – must necessarily have some effect above the species level. But whether this is an additive effect or not depends on the complexity of the relationships between the two levels in each case. At least some macroevolution is the result of microevolutionary processes. So we are only asking now if all is. This is open to debate: the E (environmental) factors that affect macroevolution are not within-species (Mi) forces, but do microevolutionary processes like gene frequency changes necessarily mediate them? And this question is still unresolved amongst specialists. One thing we can say now, though, is that we cannot draw a simple equals sign between the two domains. It is an open question, one much argued within evolutionary biology and related disciplines, whether Mi = Ma in any sense. Ontologically, all the objects of Ma are accounted for by the objects of Mi plus the objects and processes of E. However, we can't just assume all the processes of Ma are just the aggregate sum of the processes of Mi – this needs to be shown. Methodologically, we can not predict the outcomes of Ma from a knowledge of the states of Mi plus E. This is not because the outcomes of Ma are not the result of Mi and so on, necessarily, but because we cannot compute in a reasonable time those outcomes – too many variables, conditions, and interconnections (Dupré 1993, Rosenberg 1994). But this doesn't mean that we can say that it is impossible to evolve from one group to another because there is a barrier, as creationists claim. Genes and developmental sequences are extremely modifiable, and to date no barrier has been found, nor any reason to suspect one exists. All modern biology accepts that Ma is possible, through biological processes. The question is, in what ways? And that is a matter for empirical investigation, which is ongoing, and through which we are learning new things. 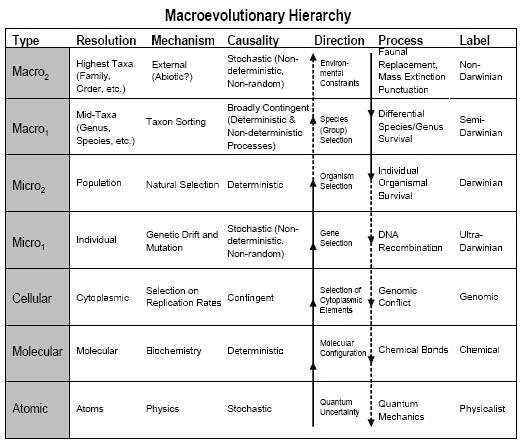 Macroevolution is at least evolution at or above the level of speciation, but it remains an open debate among scientists whether or not it is solely the end product of microevolutionary processes or there is some other set of processes that causes higher level trends and patterns. It is this writer's opinion that macroevolutionary processes are just the vector sum of microevolutionary processes in conjunction with large scale changes in geology and the environment, but this is only one of several opinions held by specialists. The misuse of the terms by creationists is all their own work. It is not due to the ways scientists have used them. Basically when creationists use "macroevolution" they mean "evolution which we object to on theological grounds", and by "microevolution" they mean "evolution we either cannot deny, or which is acceptable on theological grounds". This is not because species do not change over time – some do. This is because there is no objective and common criterion for when a species has changed enough to count as a new species. The decision to count a species as a new one when there is no splitting of the species into two or more is a matter of personal taste or convention, which means that such decisions tell us more about the preferences of the scientist than they do about the organisms. The definition of what counts as a "species" is itself debated. Most often, for organisms that reproduce sexually, it is the biological species concept, where organisms are of the same species if they can reproduce together and their progeny are fertile. However, this does not work in asexual organisms, and often fails in organisms that can interbreed across large taxonomic gaps. See The Index of Creation Claims CB801 for references. Terms like "sudden" or "rapid" or "slow" or "abrupt" are relative terms (Loon 1999). A lot of confusion occurs when people used to thinking at one timescale, such as the geological, in which an event that takes 5 million years can be "sudden", talk to people for whom "sudden" means a few generations – which depending on the organisms can be a couple of hours, months, years or centuries. Similarly, "qualitative" change is relative to the measures used. Something that is qualitatively different on one measure can be a simple extrapolation on another (for example, if exponential scales are used to graph the change). I recommend removing such relative terms from this discussion whenever possible, or quantifying them exactly, to avoid misunderstanding. Mayr, E. 1996. What is a species, and what is not? Philosophy of Science 2:262-277. Vrba, E. S., ed. 1985. Species and speciation , Transvaal Museum monograph; no. 4. Pretoria, South Africa: Transvaal Museum. Plutynski, A. Forthcoming. Speciation and Macroevolution. In Anya Plutynski and Sahotra Sarkar, eds, Blackwell's Companion to the Philosophy of Biology . Sepkoski, D. Forthcoming. Macroevolution. In Michael Ruse, ed., Oxford Handbook of the Philosophy of Biology. Acknowledgements: Thanks to Larry Moran, Matt Silberstein, Tom Scharle, Douglas Theobald, Pete Dunkelberg, Josh Zelinsky, Chris Rohrer, Erik W., and many others on the newsgroup, for comments, criticisms and outright disagreement. Thanks also to Carl Zimmer for the "vines" figure, and to David Sepkoski and Anya Plutynski for copies of their forthcoming articles.